Creating an event that reaps results like that is a tough act to follow. But Agudath Israel of America wanted to deliver even more to our yeshivos after its inaugural event for NY yeshiva executive directors and administrators last year. The Yeshiva Expo – rebranded as the Yeshiva Summit to better reflect its character – moved to an even larger venue to accommodate the increased number of guests and vendors. 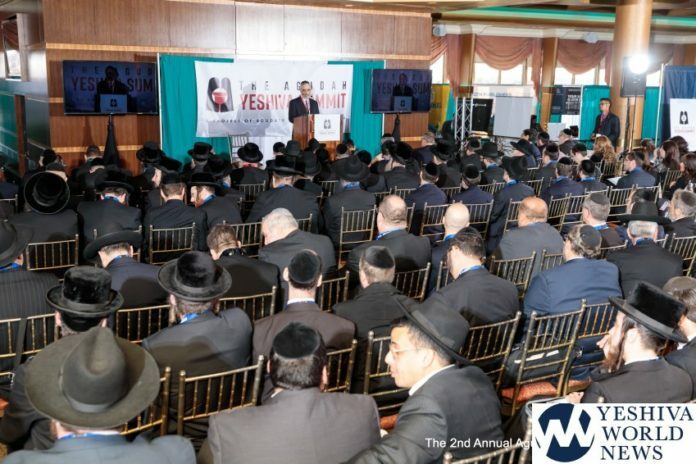 In addition to the formal sessions on legal, funding, and compliance topics offered at the summit, time was dedicated for yeshiva administrators to consult, gratis, with Homeland Security, attorneys, accountants, Agudah staff, consultants, and the government officials who administer key nonpublic school governmental programs. This way, administrators could ask individual questions in addition to hearing the day’s sessions. Another innovation of the Yeshiva Summit, which occurred at Terrace on the Park on October 24, was the Legislative Luncheon, at which nearly 20 New York City, New York State, and Federal elected officials participated. The luncheon provided an opportunity for our community to express its appreciation for the millions of dollars in NYC, NYS, and federal security and other funding streams funds that Agudah has advocated for and which really help our mosdos. It was also instructive for officials in City Hall, Albany, and Washington to see the dedicated men and woman who work in our mosdos, each representing hundreds of taxpaying parents who sacrifice and forgo utilizing the free public school system to receive an education that allows their children to grow to be proud, informed Jews. Rabbi Chaim Dovid Zwiebel, executive vice president of Agudath Israel, introduced Lt. Governor Kathy Hochul to open the Summit. Lt. Governor Hochul declared two things of importance to both her and Governor Andrew Cuomo: protecting our right to educate our children wherever we choose, and protecting these children when they are in school, noting that anti-Semitic incidents are up 90% in recent years. The $25 million of funding the Governor has dedicated to protect schools, shuls, and community centers against hate crimes is a tangible embodiment of that sentiment. (Note that the Yeshiva Summit occurred days prior to the Pittsburgh tragedy.) The Lt. Governor also introduced Michael Snow, former Assistant Director of the New York Anti-Defamation League, who has been tapped as the Governor’s new Director of Jewish Affairs. Attendees then split off to attend instructive sessions following a brief description and instructions for the day by Avrohom Weinstock, Esq., Chief of Staff and Associate Director of Education. “Overview of Governmental Funds 101: Mandated Services, CAP, Titles II-IV, Special Education” was the first of two sessions providing guidance on government funding, presented by Mrs. Leah Steinberg (Director of Agudah’s Project LEARN-Special Education Affairs); Rabbi Nissan Gewirtzman (President, Yeshiva Consulting Services); and Mrs. Sara Seligson (Managing Director, Day Schools and Yeshivot for the Jewish Education Project). Next, the State Education Department’s Ms. Christina Coughlin (Assistant Commissioner for Governance, Policy and Religious and Independent Schools) and Ms. Lori Genito (Associate in Education Improvement Services, State Office of Religious and Independent Schools) presented an “Overview of Accessing Government Funds 201: AIS, MST, SSBA, NPSE, and Multiple BEDS One Year Later.” As part of their wide-ranging presentation, the officials described the Smart Schools Bond Act, and credited the Agudah with articulately flagging a legal and classification question with the Act. Agudah’s advocacy of the rectification of this issue played a leading role in the allocation of $25 million in new technology funds to nonpublic schools and yeshivos across the state. Participants also enjoyed a rare occasion to interact and hear directly from governmental officials about their positions on issues impacting the Jewish people and yeshiva community. Congresswoman Grace Meng spoke about her role, as a member of the Congressional House Appropriations Committee, and in partnership with Agudath Israel and others, in securing $70 million in funding for the Iron Dome initiative; the creation of a special envoy against anti-Semitism; including synagogues for eligibility for FEMA funding; and doubling the funding allocated for the Nonprofit Security Grant. Speaking warmly, Assemblyman Joseph Lentol noted that the Chassidic community truly fought for itself, coming to America after the war and rebuilding Williamsburg, an area Assemblyman Lentol grew up in and now represents. Anti-religious and anti-Semitic sentiments are a growing trend, he noted, and are unacceptable. Also present at the luncheon were State Senators Joseph Addabo, Simcha Felder, and Leroy Comrie. Their colleagues Assemblymembers Stacey Pheffer Amato, Rodneyse Bichotte, Andrew Hevesi, Alicia Hyndman, Daniel Rosenthal, and Nily Rozic also attended, as did City Councilmembers Mark Levine and Eric Ulrich. With all these govt resources pouring in to yeshivos, our tuitions continue to rise. Something does not smell right. I hate to break it to you but the numbers that both the Agudah and TEACH NYS throw around are for ALL PRIVATE SCHOOLS not just yeshivas (or even Jewish schools). Additionally, most of these funds are not able to be used for operating costs (payroll, rent, maintenance, utilities etc.) Also many of the programs require schools to lay out money and then submit for reimbursement. Many of these programs are “add ons” meaning the school would not have them if there was no government money so again it does not help lower tuition costs.